I like to tuck things into chicken thighs. (Exhibit A – Grilled Salsa Chicken & Exhibit B – Grilled Marinara Chicken) I realize that this might sound strange, but it’s how I cook with chicken thighs…when I’m not cooking them in the slow cooker. The other day I was planning to fix some chicken thighs in the slow cooker with a couple garlic cloves and some rosemary from the garden. Except, remember, I’m losing my mind (and apparently not just in the grocery store parking lot! ), and I completely forgot to start them in the slow cooker in the morning. I was too busy trying to shuffle 3 kids out the door to get to the gym. Nevermind that it was written clear as day on my fridge calendar…Slow Cooker Rosemary Garlic Chicken. Slow cooker. Hello, start the slow cooker! So I still wanted and needed to cook these chicken thighs. So tucking the garlic and rosemary in and then baking them would just have to do. And in all honesty, I’m glad I forgot to start the slow cooker…because I think they turned out much tastier this way! 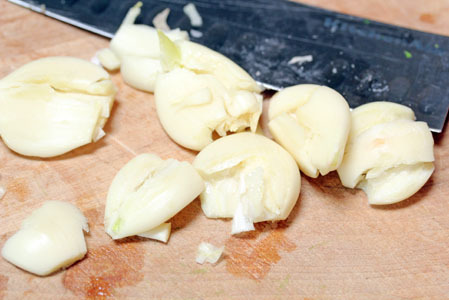 With the flat side of the knife, smash the garlic and crack it open. 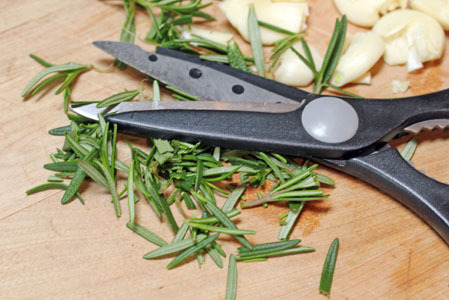 Snip the rosemary…don’t forget about all the uses of kitchen shears! Snip just enough to let out all the aromatics and fragrance of the rosemary. 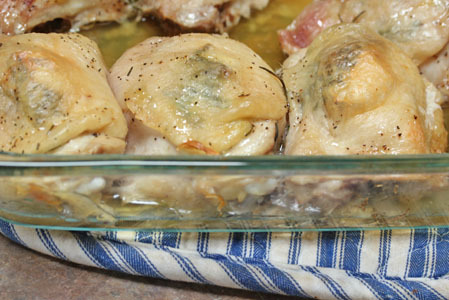 Pull back the skin of the chicken thighs. 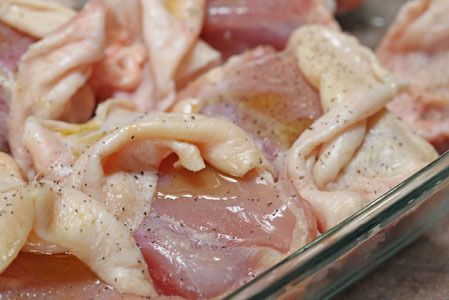 Drizzle the olive oil over the chicken meat and sprinkle with salt and pepper. 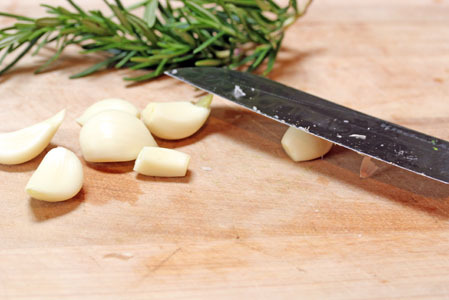 Tuck 1 smashed garlic clove plus a pinchful of rosemary leaves under the skin of each thigh. Pull the skin back over top and repeat for each thigh. They come out looking like this…the flavors have all infused into the chicken as the skin cooked over top. Peel back the skin. 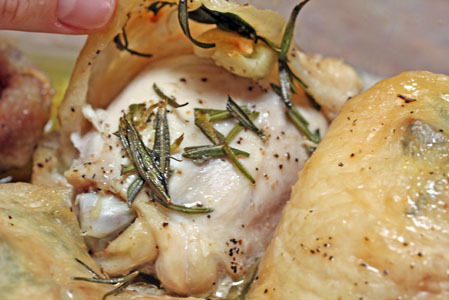 Serve the chicken with the rosemary and garlic still on top. Sprinkle a little Parmesan cheese over the top of the chicken and noodles. 1 large or 2 small rosemary sprigs ($.25) Or less if you have any on the garden! 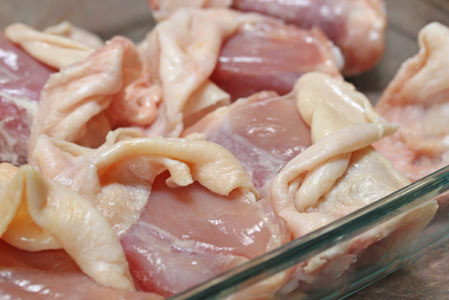 Pull back the skins of the chicken thighs. Drizzle a little olive oil over each thigh and then sprinkle with salt and pepper. 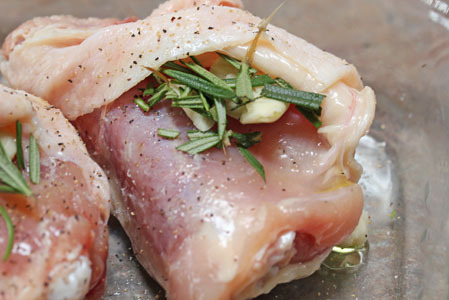 Take the smashed garlic and the chopped rosemary leaves and tuck them under the skin of each chicken thigh. 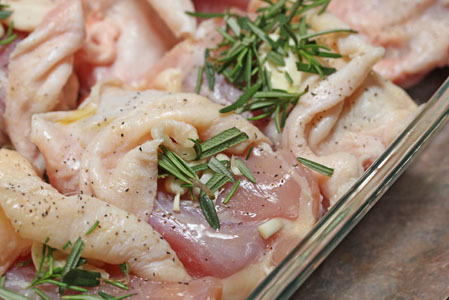 Bake in the preheated oven for 45 to 50 minutes, or until chicken has cooked through and juices run clear. Meanwhile, cook the pasta noodles. Drain and toss with a drizzle of olive oil plus the Parmesan cheese and some garlic salt to taste. If desired, sprinkle a little Parmesan cheese over top of the chicken and noodles after you have plated the food. Prepare peas, or other veggie side dish. 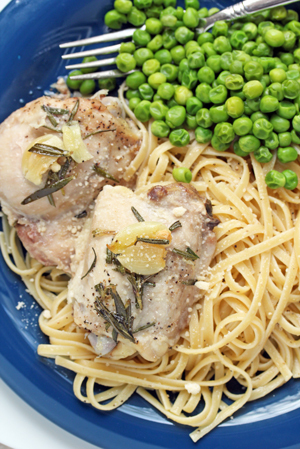 Serve Baked Rosemary Garlic Chicken over Parmesan noodles with side of peas. Looks heavenly! I think I’ll pair this up with wild rice! Wow, looks great. Can’t wait to try this. So simple too. My family loves the fragrance of rosemary leaves with poultry, beef and roasted vegetables. Great cooking herb! Your recipe is great and I really like your clear instructions, will definitely try it. Love your photos: they make it very easy to understand how to make your dish like a “pro.” Thank you for sharing. Yum! I just bought some thighs last night, with manager’s special $2 off coupon it made them about 60-70 cents per lb. I usually never buy thighs, as boneless are too high, and the other kind have skin & bones making them “not a good buy” in my book. So I was at a loss what I was going to do with them, and shoved them in the fridge to deal with later. Ta Da!, in comes your blog to save my day. I don’t have fresh rosemary but I will use other herbs. You’re not losing your mind because you are cognizant of the fact you are. You are simply stretched too thin and need to carve out some margin for yourself, not easy with a young family. For remembering the crock pot when you have no margin so are prone to lose your mind, I tape a note (because sticky notes fall off I use tape) on the inside of the back of the door. Where you HAVE to see it on the way OUT of the door. It works! I like these kinds of posts, so I wish I could stay subbed. But the constant coupon posts become spammy quick, bummer, but I guess the rest of your subbers like the coupon posts. Best wishes! how in the world did you only pat . 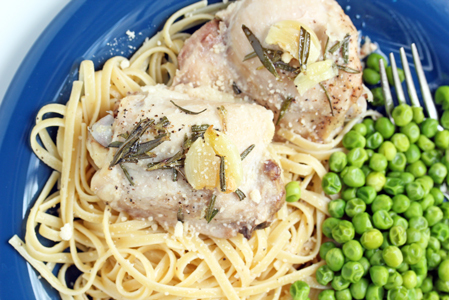 10 cents a pound for the pasta in baked rosemary chicken dinner? I have purchased several boxes of free pasta in recent months. And usually pay less than $.30 per box…on occasion $.50 a box. I match coupons with sale prices and store promotions.